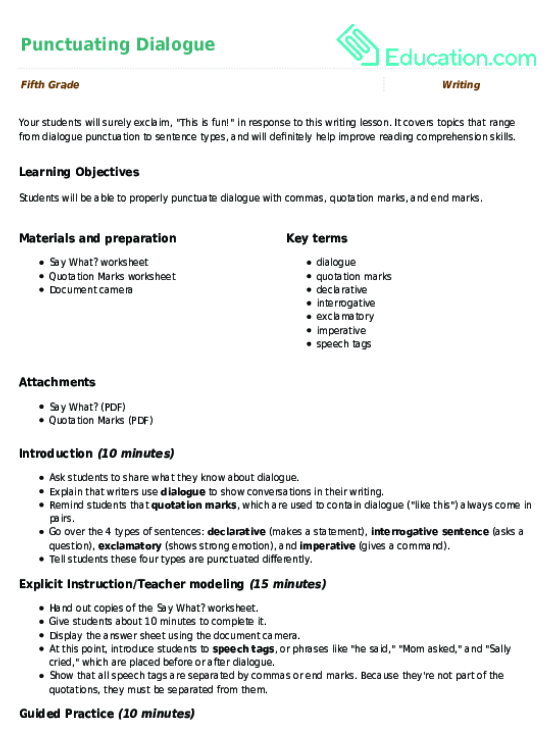 Students will be able to properly punctuate dialogue with commas, quotation marks, and end marks. Ask students to share what they know about dialogue. Explain that writers use DialogueTo show conversations in their writing. 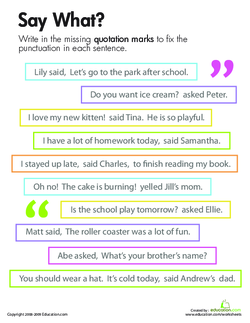 Remind students that Quotation marks, which are used to contain dialogue ("like this") always come in pairs. Go over the 4 types of sentences: Declarative(makes a statement), Interrogative sentence(asks a question), Exclamatory(shows strong emotion), and Imperative(gives a command). Tell students these four types are punctuated differently. Hand out copies of the Say What? worksheet. Give students about 10 minutes to complete it. Display the answer sheet using the document camera. At this point, introduce students to Speech tags, or phrases like "he said," "Mom asked," and "Sally cried," which are placed before or after dialogue. Show that all speech tags are separated by commas or end marks. Because they're not part of the quotations, they must be separated from them. Have students go through their worksheets and underline all the speech tags. 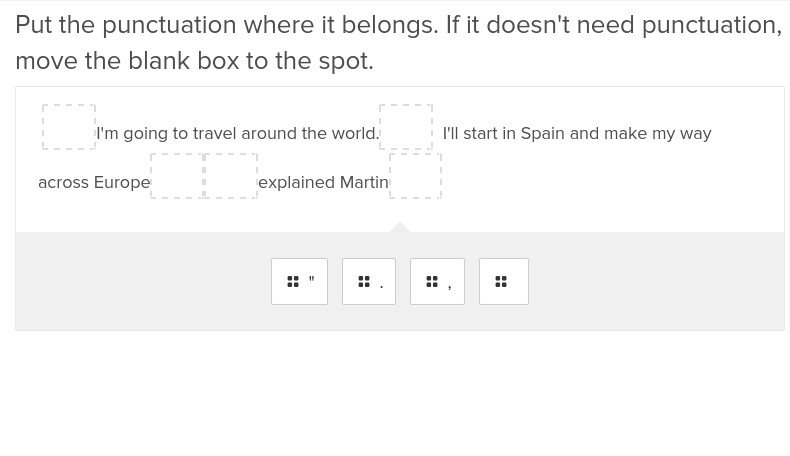 Have the students circle all end marks or commas that separate the speech tag from the rest of the sentence. Go over the answers on the document camera. 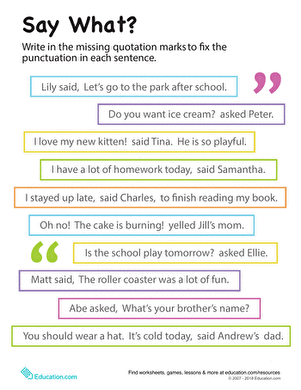 Hand out copies of the Quotation Marks worksheet. Tell students to use their marked up Say What? worksheets to help them complete the new worksheets. Give students time to work independently, and check in with struggling students. Enrichment:Advanced students can be asked to write five sentences with dialogue instead of (or after completing) the Quotation Marks worksheet. Challenge students who need a greater challenge to insert the speech tag in the middle of one of their sentences. 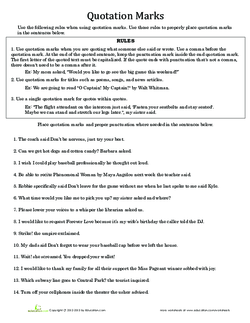 Support:Pull struggling students aside and complete the first three questions of the Quotation Marks worksheet together with them. This will help them become more familiar with the process of punctuating. Circulate the room and informally assess students as they work. If there's enough time available, go over the answers to the worksheet on the document camera once students are done working. 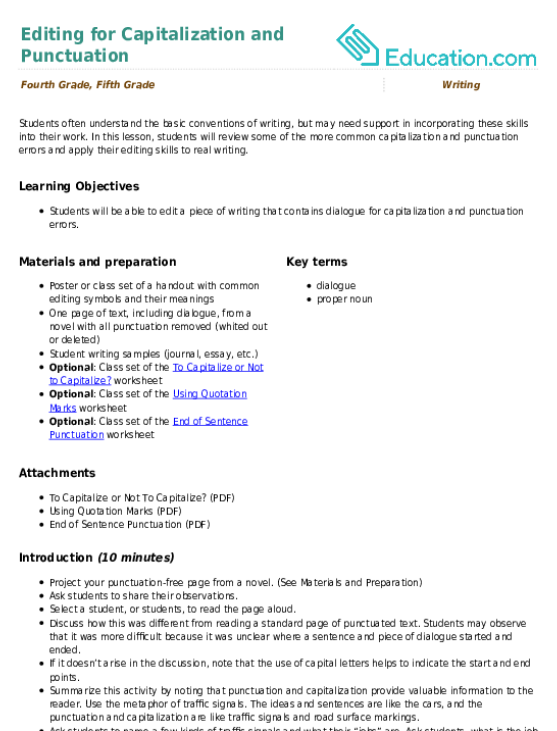 Review the definitions of the key terms. Remind students to keep their writing properly punctuated. Writing reports and other kinds of informational pieces is a skill unto itself. It covers topics that range from dialogue punctuation to sentence types, and will definitely help improve reading comprehension skills. Have your fifth grader fill in the punctuation mark blanks in these exercises that are built specifically to teach and solidify key concepts.